Pega Marketing is a Pegasystems application in which you can use marketing strategies for inbound and outbound marketing campaigns to engage with customers. The Pega Marketing application is built to manage big data; however, when you start using the application you might have no or very little customer data to use. In marketing campaigns, customers are referred to as the audience, which is one of the essential elements in every marketing campaign. In this tutorial, you learn how to generate random data records for Pega Marketing volume testing, demonstration purposes, or usability testing in the absence of customer data. You also learn how to generate sample input for Adaptive Decision Manager (ADM), Visual Business Director (VBD), and Interaction History (IH). Before you continue with this tutorial, make sure that you understand how the Pega Marketing application, the Monte Carlo data set, and Decisioning Services work. For more information, see Getting Started with Pega Marketing, Monte Carlo and other data set enhancements, and Services landing page. This tutorial takes approximately 15-20 minutes to complete. Import the MarketingSample.zip archive file, which contains rule instances that are required to complete this tutorial. The archive file is compatible with Pega Marketing 7.22. Download the MarketingSample.zip archive file. Log in to the Pega Marketing application. In the Import wizard, click Choose file, browse your directory, and select the MarketingSample.zip file. As you complete the Import wizard, accept the default settings. In the Application menu, click Open Application. In the Application rulesets section, click Add ruleset. Run the Initialize Customer Data data flow to generate 50,000 synthetic customer records and sample input for Adaptive Decision Manager, Visual Business Director, and Interaction History. For more information about the data flows and data sets used in this tutorial, see Overview of data flows and data sets for generating random data records. Click Designer Studio > Decisioning > Decisions > Data Flows > Batch processing. Click New and run the Initialize Customer Data data flow. For more information, see Creating a batch run for data flows. Optional: When the batch run has completed, open the Pega Marketing application to see the result of the data flow run. Click Dashboard to view business metrics. Interaction History – Displays the interaction results on propositions. For more information, see Interaction History landing page. Visual Business Director – Visualizes decision results in a three-dimensional (3-D) graphical view. For more information, see Accessing Visual Business Director (VBD) planner. Adaptive Models – Displays the distribution of responses. For more information, see Introduction to adaptive models reporting. You can see all the adaptive models that were generated by the Response Simulator strategy on the Adaptive Models Management landing page. For more information, see Accessing the Adaptive Models Management landing page. The Marketing Sample.zip file that is used in this tutorial contains several rule instances that are required to generate synthetic customer data records. For details about how to create any rule instance, see Creating a rule or data instance. The Initialize Customer Data data flow uses the Sample Customer data set as the source of data, saves data records into the Customer data set, and runs the Initialize Response Data data flow. The Initialize Response Data data flow uses customer records that are passed from the Initialize Customer Data data flow and runs the Response Simulator strategy on the records. There are three destination data sets where the strategy outputs are saved: Interaction History, Adaptive Analytics, and Actuals. The records in the Adaptive Analytics data set are used to refine adaptive models, and the records in the Actuals data set are used to visualize data in Visual Business Director. For more information, see Adaptive Analytics and Visual Business Director (VBD) planner. The Sample Customer data set is an instance of the Monte Carlo data set that is configured to generate 50,000 synthetic customer records. Each record contains several random properties that were generated according to the defined fields in the data set. These are properties that you might find in customer data records, for example, customer name, age, ID, income, home address, phone number, and so on. The Sample Customer data set also generates interactions for each customer record. 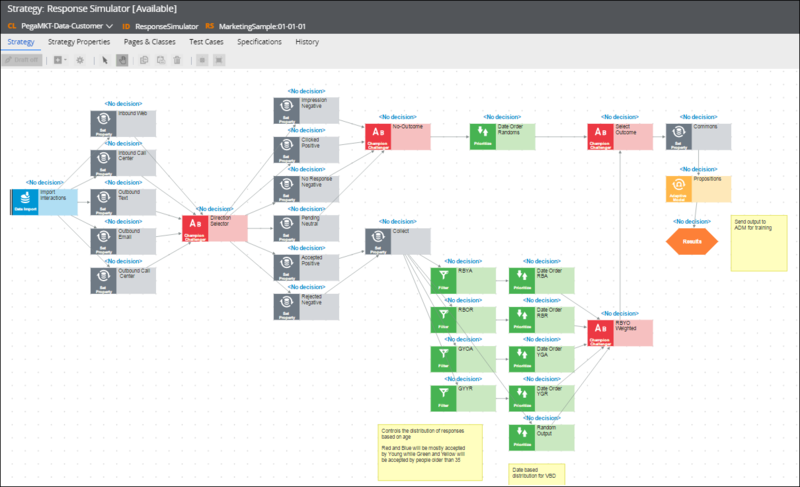 These interactions provide sample input for Adaptive Decision Manager, Visual Business Director, and Interaction History. To sum up, in this tutorial you imported the MarketingSample.zip archive file with rule instances into the Pega Marketing application. You ran the Initialize Customer Data data flow to generate 50,000 synthetic customer records with several interactions for each record. Finally, the Response Simulator strategy generated sample input for Adaptive Decision Manager, Visual Business Director, and Interaction History.